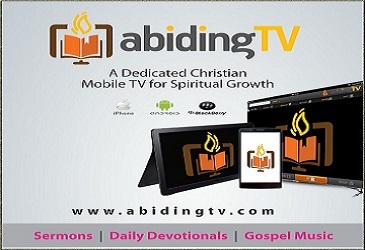 Grow in spiritual strength and become better acquainted with our Lord and Savior Jesus Christ” (2 Peter 3:18 TLB). “Truth, wisdom, learning, and good sense — these are worth paying for, but too valuable for you to sell” (Proverbs 23:23 GNT). 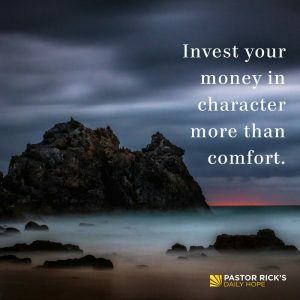 We like to spend money on comfort, but the Bible teaches that it is wiser to invest in character. God wants us to take some of our money and invest it in ourselves — in personal and spiritual improvement. The Bible says, “Grow in spiritual strength and become better acquainted with our Lord and Savior Jesus Christ” (2 Peter 3:18 TLB). The Bible also says, “Buy truth — don’t sell it for love or money; buy wisdom, buy education, buy insight” (Proverbs 23:23 The Message). God wants you to develop skills and educate yourself so that you can become the kind of person he has shaped you to be. Anytime we use our money to buy a Christian book or a resource that helps us grow, we’re investing in God’s Growth Fund. Whenever we use our money to take a class or learn something that makes us more of who or what God wants us to be, we’re investing in our growth. And God is smiling because we’re using our money in the right way. What keeps you from investing in growing your character? How do you want to grow spiritually this year? How does your spending reflect your priority to grow as a Christ-follower? What one step will you take today to invest in your growth toward Christlike character?